CLICK ON A GREY BAR OR TAP. You did a marvelous job. Its so hard to believe it is over 60 years old !! One thing I miss that was on my old stove, is the time bell that was on the far right beside the 2 burner knobs. If it is posible to get one, I will pay you for it. It had a loud ping, not like the buzzers they have now. I recently relocated from New Jersey to California and needed a refrigerator for my apartment. My daughter has been living here for 12 years and said "SAVON APPLIANCE" . My daughter went to Marsha and found a white Kenmore ... a little above my very low and unreasonable budget. No questions asked, Marsha accepted a deposit of $125.00 which INCLUDED free delivery, set up, AND A LIMITED WARRANTY. Since arriving on 9/15/13, I suffered a severe back sprain. I called Marsha and asked her if I could pay half of the balance this month, and the remainder next month, and without hesitation she was completely compassionate and said that was fine and not to worry as I kept apologizing. The refrigerator was spotlessly clean and is working perfectly! As long as I'm a "California Girl", I will NEVER shop anywhere for an appliance other than Savon Appliance. we bought a fridge from them 6 months ago it broke down they took it away said it wasn't fixable. they gave us a temporary fridge because we have a 2 month old with a lot of breast milk in the freezer. i was freaking out about my babys milk. Marsha was concerned about it as well. Since our old fridge was not able to be saved Marsha told us to pick out a fridge and it would be delivered at no cost. now we have a working fridge with babys milk still frozen. awesome service! I bought a fridge here 11 years ago and it is not working correctly now. I called and made a service appointment, but went in a day later thinking maybe it's time to buy a newer fridge. Marsha not only talked me out of it (instead of taking advantage of me and selling me something), but gave me some tips to try and even asked me to call her later after I tried them. I still need them to come out, which I have an appointment for tomorrow, but I am truly impressed even after 11 years. Talk about amazing customer service and really caring person to person instead of just the $$. So nice & refreshing. Also, my Mom bought a stove from them about 8 years ago and they have taken care of that too, still working beautifully for her. I highly recommend them, really amazing. I would like to give Savon Appliance a GREAT review!! I have used them for years and I have never been disappointed. From the time you walk in and are greeted by Marsha till you have your appliance delivered and installed I have never been happier!! Marsha knows what she's talking about!! I will always use Savon and recommend it to anyone looking for Good professional and thorough treatment! I will never buy another appliance unless it's from Savon. They are so honest and reliable, and they treat you like family. I went in the other night to drop off a payment and before they would accept it, they invited me into their friends and family holiday party and loaded me up with party food. They don't treat you like another customer at a department store and look you up by order number, they know your name. I recommend Savon to anyone who wants a reliable appliance, newer or older, and wants to give their business to a local family-owned company. Marshia, the owner, also has endless knowledge. She really knows these appliances inside and out. If they weren't so good at their job, you'd wish your appliance needed a repair so you could see them more often. GREAT BUSINESS RUN BY GREAT PEOPLE. Got great assistance from the lady that works (owns?) there. We were looking for a used gas dryer for my brother-in-law's apartment. She showed us a good deal on a Maytag. And she also asked about the current (broken) unit my b-i-l has. It was a Roper model. Before selling us the Maytag, she told us to see if we can repair the Roper - check the fuse, then the igniter. She even showed us how to get to these parts. On top of that she provided the parts (fuse and igniter) for us to use and pay her when we get back to the store. She was that trusting! We were able to fix the Roper dryer. We came back and returned the igniter and paid for the fuse. She saved us hundreds of $. Where else can you get this kind of service? Guidance and information before profit? We desperately needed a large capacity washer but not another expense. We managed without one for quite sometime after learning about repair issues. After viewing customers' positive reviews, we called, then decided to stop in. Not only did we find a good sized selection with great prices but the best part of our visit was meeting Marsha. Her vast knowledge about appliances was impressive. We truly appreciated her time, all the info she shared and great conversation! Excellent service from the moment we called until the skillful delivery service left our home! We are really happy with our Whirlpool Super-Capacity-Plus and look forward to taking another look at all of their unique stoves! We desperately needed a large capacity washer but not another expense. We managed without one for quite sometime after learning about repair issues. After viewing customers' positive reviews, we called, then decided to stop in. Not only did we find a good sized selection with great prices but the best part of our visit was meeting Marsha. Her vast knowledge about appliances was impressive. We truly appreciated her time, all the info she shared and great conversation! Excellent service from the moment we called until the skillful delivery service left our home! We are really happy with our Whirlpool Super-Capacity-Plus and look forward to taking another look at all of their unique stoves! This a a really great place to get used appliances. They give them a "tune up" and guarantee them as well! I love this place! We have purchased so many W/D, fridges and D/W here for rental properties. Marcia is the best and really knows her stuff and has helped us pick out brands that were built to last. If it's a simple repair that my husband can do, she's happy to sell us the part to save the service call fee. It's funky place but we've never had a bad used appliance from here in the 8 years we've been buying. Highly recommend!!!!! For rentals or really high end antique stoves, etc. Also highly recommend for repairs on other appliances-service call is very reasonable. Bought a slick late 1950's - early 1960's refrigerator for a fraction of the price of a new model. Marsha is very helpful and knowledgeable, and loaned me a small refrigerator until the one I picked out was repaired (some of their stock is awaiting repair). I'm glad I went here instead of best buy or costco, etc. I walked in on Thursday afternoon and spotted what I wanted right away-an apartment size fridge. The price was right in my price range, and told the proprietress, Marsha I was interested. In all, the complete transaction took less than 10 minutes, which as a native New Yorker I was pretty impressed by. They delivered the next day, and hour early (yay!) and took all of about 10 minutes to install my fridge. I am able to enjoy a cold beverage on the hottest day of the year thusfar, thank you Savon! So so nice!!!! I went in looking for a replacement piece for my fridge and had the best customer service!!! They had great prices too!! This place was great. I found them on Yelp and again Yelp did a great job recommending a place. Our new apartment didn't have a fridge so we needed to find one cheap and fast. The store was smaller than I imagined but it was full of all kinds of options. It seemed no matter what your taste you would be able to find a style you enjoyed. The woman, maybe the owner, was very accomodating. She helped us narrow down our options and then left us alone while we made the decision. She even helped us figure out which way the door should open. The best part of buying the used fridge from Savon is their 12 month service plan that comes standard with all their appliances. When we got the fridge home it made this horrible noise and we didn't know if that was just how this fridge sounded or if something was wrong. When we called to ask they told us they would come out the next day to check. They arrived early, and then waited for one of us to get home, and still fixed the fridge in less than 20 minutes. Our fridge now runs great and at less than half what we would have paid for a new one. I sincerely recommend Savon if you are looking for quality used appliances. I can't say enough good things about this store! 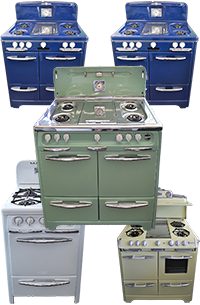 They also have an AMAZING selection of vintage stoves that are so wonderful to look at and are in mint condition! I had a problem with lighing a very old stove, and though I was fine with paying for a service call, they talked me through the process over the phone, and it worked! No service call or expense, but great service!